I gave in and hit the local GameStop during lunch today and pre-ordered my copy of Grand Theft Auto IV - Special Edition. Grand Theft Auto IV the game with special packaging (a lock box). 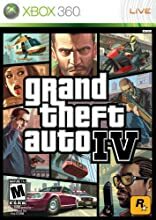 The Sounds of Grand Theft Auto IV: A selection of our favorite music from the soundtrack of GTA IV. This album will only be available within the Special Edition package and will feature original tracks from some of today’s hottest artists. The Grand Theft Auto IV and Rockstar Games Art Book: This will be the 1st ever GTA art book to be published by Rockstar Games and will feature exclusive art unreleased anywhere else. An exclusive Rockstar Games keychain to hold your lock box keys. Yeah, I’m crazy, and yeah, it did cost me $90… $30 more than the game alone. But I’m a GTA junkie, and they make this crap targeting me personally. I can’t say no. I’m just as bad as the Halo junkies who will be paying megabucks for the version of Halo 3 with the mini replica helmet. The thing is scheduled to ship on October 16. If they could guarantee it would be in my hands on that day, I’d schedule my PTO right now. .NET 1.1 XSLT performance is pretty slow (slow enough that it’s noticeable when the preview refreshes) so the code actually manually recurses through an XML document object and generates HTML on the fly. Every time either rendering engine changes the way they do things (or fixes a defect), I have to manually implement that transformation in code using XmlNode and XmlDocument objects. I can’t just take the changes to the XSLT that the products include. Since I’m working at pre-compilation time, generating the method signature in a nice formatted way is a huge pain, and it’s different for each rendering engine. Doing this involves manually running around the parsed code tree in DXCore and converting the parsed nodes into nicely formatted, human readable HTML. CR_Documentor was originally a one-trick pony, so the rendering mechanism isn’t really… “pluggable.” I started refactoring to get there, but because the generation of the HTML is so specific to each renderer and there’s so much to it… frankly, I’ve gotten overwhelmed. As I’ve said before, I can’t open source the thing and get help because there are legal ramifications around it involving Lutz working at Microsoft now and the code originally being his. I’d love to get some help on it, but it’s not really a possibility. Anyway, I started down the path of getting Sandcastle support in there and it’s become pretty beastly. What I’d like to do is actually make use of XSLT so I can vastly simplify the rendering for each preview type. It would also allow me to more easily directly take the XSLT from the various products (NDoc, Sandcastle) and use them with very minor, if any, modifications. Making it easier to take advantage of that would also make it easier for me to add new preview styles (Sandcastle, for example, has multiple templates available). I will probably have to remove features like the ability to highlight “unsupported tags” or set a “supported tag set” for troubleshooting your documentation. I’ll still be able to notify you of errors (like if your doc doesn’t parse out right) but the supported tag set thing was only really workable because I had programmatic control over the rendering at that level. Does anyone care? Any big voices to continue supporting VS 2003? If not, I’m going to scrap the garbage I’ve been trying to do to get this done and start working on getting it to transform using XSLT. I just finished converting over to Subtext, and, all things considered, it went reasonably well. A lot of work went into the migration, though - a lot more than I really feel should have. But at least I’m moved over. Get a SQL 2005 database (pMachine was stored in MySQL). Write a BlogML export utility for pMachine (which I will be contributing to the BlogML project). Write a utility that creates a map of old IDs for my blog posts to new Subtext friendly URLs. Write a converter that takes the ID map and generates a redirection utility in PHP to replace the old blog pages (so they’ll get you to the new blog). Write a utility that goes through the BlogML export and updates all URLs to the new Subtext URLs so the blog proper doesn’t actually rely on the redirection mechanism for cross-post links and images. Write a utility that goes through the BlogML export and updates all the comment text because there’s a weird issue with Subtext BlogML import that converts all newlines to line break tags… and then encodes any line break tags you already have so they end up being visible. Not pretty. Manually break the BlogML export into three pieces - the request times out if you try to upload a 5MB BlogML file. Import all of the BlogML pieces. Swap out all of the old pMachine pages with my redirection utility. Update my old RSS feed so folks know they need to get the RSS through Feedburner. Little fine-tuning things. The BlogML import doesn’t populate the author name or email in the Subtext database so I’m going to have to do some work there. The Subtext configuration proper is easy, but you have to set things up (like your Feedburner name and stuff). Category cleanup. I’ve got a pretty crappy category breakdown and it’s time to clean that up. Custom skin. I picked a decent stock theme for now, but I want the site to be me. Blogroll and links. I didn’t really export the original set of links or anything, figuring I’ll add links as I see their usefulness. I already know of a couple of blogs that I read I should add. “About” section. The old “about me” section had seen better days and depended on the old pMachine code to generate its template. I need to come up with a new section. Script integration. I want to get my little Xbox Gamercard popup thing working again, and the Amazon link script where they pop up a nice review and image of things you’re interested in - that’s neat. I also want to add some other stuff, like a scrolling Twitter history deal and maybe a few other fun items. Oh, and if anyone knows how to write a PHP page that will not only send the “Location” header but also let me change the status code, that’d be awesome. I’m trying to do that in PHP 4-point-something-or-other so I don’t have the ability to do much. I’ve tried the http_redirect method and that doesn’t work. Right now I’m using header("Location: $newlocation") which is supposed to automatically throw out a 302 redirect status, but I’ll be damned if I see anything other than a 200 come through when I watch in Fiddler. The browser sees the “Location” header and displays the content from the right page in Subtext, but the URL in the browser doesn’t change. Regardless, I’m back in the saddle with a new blog package and finally feel like I’m living in the now. Time to join up on the Subtext project and start contributing!